It is no secret that we like to spend a lot of time outside. 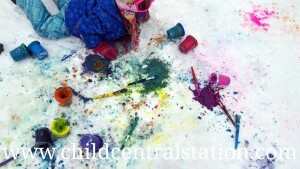 This winter the children have really enjoyed painting the snow. 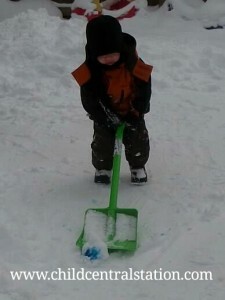 I know I have shared numerous posts in the past in regard to the various ways that we like to paint this snow. This year paint seemed to be requested far more frequently and the paint of choice has been watered down tempera. The beauty of this paint versus some of the other choices we have used in the past is how vivid it is, and how long the snow holds the color, even when it is covered up by inches of fresh snow! The children found the "gems" by accident after a fresh snowfall..... We have lots of shovels in various sizes and a small "yooper scoop." 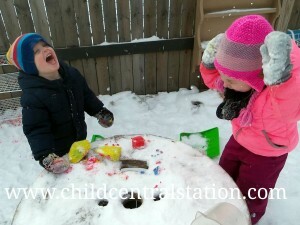 After one child stumbled across a colored chunk of hardened snow, the "gem rush" was on. Where could we find more gems? How did they get there? Why were some big, and some small? and How did we get so many different colored gems in the yard? Without any prompting... there were claims to various sections of the yard. "You dig there! I'll dig here! Hey... that's my spot to dig!" And of course, children found various places to hide or save their loot as well... One of the children was more enthusiastic about the hunt than most of the others and after awhile, they deemed all of the gems to belong to her. 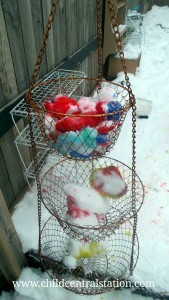 As gems were excavated, they were promptly delivered and stored near our mudpie/snow cake kitchen. The children used the gems as treasures and they were closely guarded. After a few days, the gems were used as props for all kinds of different things... They made the perfect wintertime loose part! 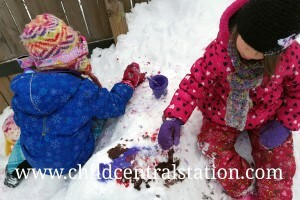 Do your children like to paint the snow? Have they ever dug up their art as "gems" days later? I'd love to hear about your experiences with snow painting too! 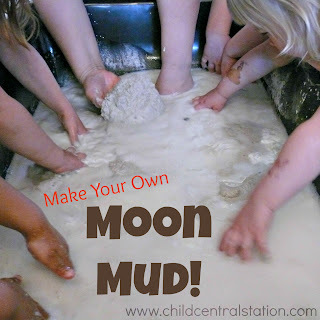 Leave me a comment here or hop on over and find me on Facebook!